From the early 19th Century onwards, dancing is the vogue in Paris. After the settlement of the July Monarchy in 1830, the French capital is hit by a full-fletched dance mania. The whole of Paris gleefully swirls in the mundane salons, as well as in the popular ‘guinguettes’. Everybody dances and has other people dance, for as one police prefect in was prone to say: ‘As long as people are having fun, they are not conspiring.’ In large halls or vast gardens, promoters with a nose for good business organise public balls completely in the service of dance and its side activities. On Carnival even the opera house opens its prestigious hall to the domino masks of elegant ladies and gentlemen and to the costume balls of an audience of a greater social mixture than otherwise would be the custom. At times these ‘bals masqués’ even cause a scandal. The Théâtre des Variétés, Tivoli, Mabille, Ranelagh, Grande-Chaumière, Vauxhall, Jardin-Turc are but a few of the places for the quadrille and dance to draw considerable flocks of people who are on the lookout for dancing, beautiful orchestral music or who are simply into a little diversion and a walk. The concept of promenade concerts is born when the performance of dance music is combined with symphonic overtures, opera fragments and performances of virtuoso solo players. These truly spectacular concerts come with lively shows exhibiting all kinds of scenic effects in a mixture of classical and light music. In those days dance music is omnipresent: it manages to rouse the great passions and serves as a commercial magical formula for many opportunists. For music publishers this repertoire represents a considerable segment of the market. Dance music is published and arranged for various instruments or combinations of instruments: piano, violin, string quartet, flageolet, cornet à pistons, guitar, harp, ophicléide, etc. Enormous dance manifestations assemble impressive orchestras, like the Musard orchestra, whereas the bourgeois salons and smaller balls settle for smaller ensemble. 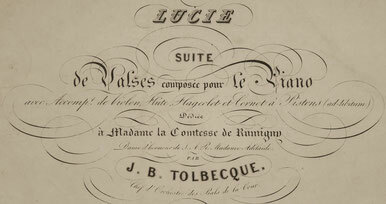 Little by little a standard cast is established, and is often mentioned as such in the music prints of those days: piano, violin, reverse flute, flageolet and a cornet à pistons. The piano forms the basis of the ensemble, the use of the other instruments was rather ‘ad libitum’, based on the availability of the musicians, as well as on the performers’ preference of colours and shades. 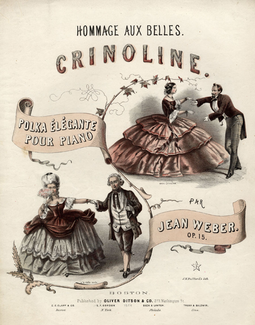 The waltz, imported in France at the beginning of the century, was already performed in pairs, but for quit a while was not all that much performed, as it was considered to be all too ‘intimate’. 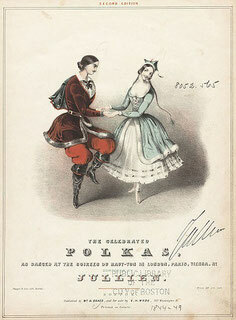 But in 1844 another pair dance breaks through in the French capital: the polka. Consisting of a simple step instead of connecting figures, its success is incredible – be it with the help of a crushing publicity campaign. Other dance fashions succeed this polka mania and continue to sustain the commercial activities of the dance masters, ball entrepreneurs, publishers and serial writers. The mazurka, the redowa, the cracovienne, the varsovienne, the scottish and other more fleeting dances succeeded each other at a terrible speed. But fashions are short-lived. For instance, the cancan, an improvised dance which was taken up in the quadrille, was considered to be scandalous in the beginning of the July monarchy. As soon as in 1840 it was readily adopted by the snobbish avant-garde and by the end of the reign of Louis-Philippe it was already seen as outdated. Season after season dance fads are passing by. flageolet and cornet à pistons, and particularly the cast known as ‘Les Pantalons’: piano, violin, flageolet and cornet. During the first years of the July Monarchy Louis-Antoine Jullien (1812-1860) is Musard’s main rival. As a conductor and composer he manages to put himself on the map as a real showman. Among other things, this great animator of the Parisian music scene leads the orchestra of the Jardin-Turc. He organises highly acclaimed dance balls and his concerts are qualified as ‘monstrous’. Making use of all the scenographic means that his days had in offer, his concerts bring together a great many musicians who flawlessly alternate quadrilles and other dances with solos, symphonic orchestral works and fragments from operas. In part because of the intervention of the virtuoso Koenig, he attributes the cornet à pistons a special place, but he also does so for other instruments such as the small flute. 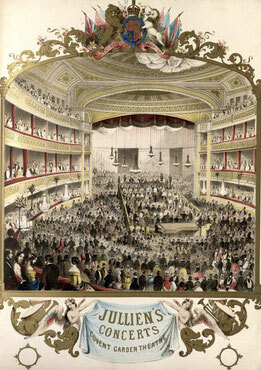 From 1839 onwards Jullien lives in London, where his promenade concerts are a standing success. As the manager of the Drury Lane theatre, he has Berlioz come over to London for the very first time (in 1847-1848) to direct the orchestra. But Jullien’s financial debts has him taste prison life, so that he once again goes off to live in exile, this time in the United States, where madness eventually will be the end of him. Before the arrival of Musard, Jean-Baptiste Tolbecque (1797-1869), born in Hanzinne, Belgium, is the most famous dance composer in Paris. His appointment as the organiser of balls at the court is preceded by his fame as a highly acclaimed conductor in Tivoli and other public gardens. His productions of quadrilles and waltzes is impressive. His younger brother, the violin player Charles-Joseph Tolbecque (1806-1835), conducts the orchestra of the ‘Théâtre des Variétés’, another trendy venue of the Parisian entertainment scene. Before his untimely death he also composed dance music.